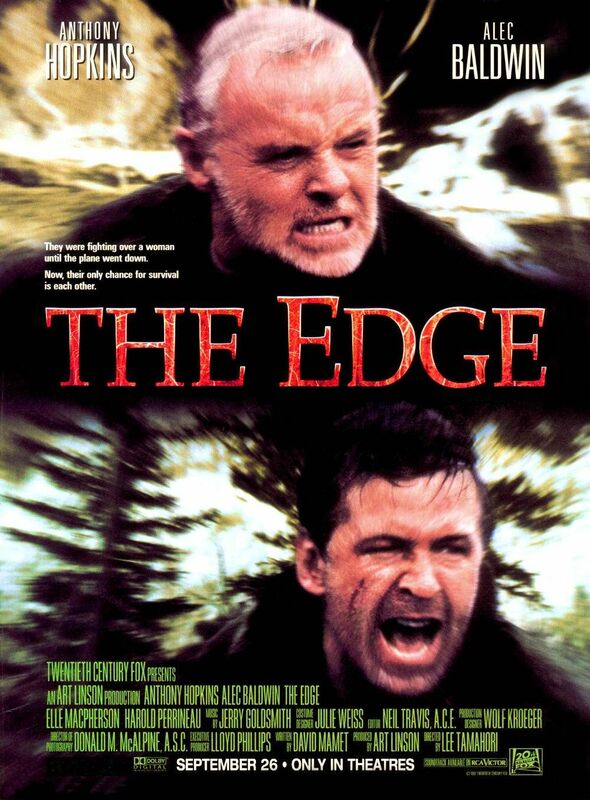 The Edge starts out innocently enough, a genius billionaire named Charles Morse (Anthony Hopkins) decides to accompany his supermodel wife, Mickey (Elle Macpherson), on a remote Alaskan photo shoot. You know, a typical rich person’s getaway weekend. Fly up to the peaks. Rent a three story scenic cabin run by a cantankerous woodsmen. Take a couple of snaps in a Native American headdress. Billionaire type stuff. Along for the ride are Mickey’s personal photographer, Robert Green (Alec Baldwin), Robert’s twist-sporting assistant Stephen (Harold Perrineau) and a couple of background extras fresh from the Eddie Bauer outlet. For the first thirty minutes you might think The Edge will be all fun and games. The gang drinks a little champagne to celebrate Charles’ birthday. Robert pranks Charles in the middle of the night by wearing a bear skin and surprising him. They engage in some light ribbing with the spooky old proprietor of the cabin. (And by the way, that spooky old proprietor is played by none other than LQ Jones, director of the cult classic A Boy and His Dog which is another film featuring prominent acting by an animal… but more on that later). But trouble starts when Robert decides he’d like Mickey to pose with a real Native American for his tasteless photography. So why not jaunt on up to the hunting cabin of a local Indian and see if he’s available for some on-camera work? Seems easy enough. Except that as Charles, Robert and Stephen make their way to the remote cabin their float plane hits a flock of migrating geese. They crash. The pilot dies. And before you know it, Charles, Robert, and Stephen are stranded in the wilderness, bickering among themselves, pursued by a man-eating bear, and caught in a weather pattern that, in minutes and without warning, can to switch from bright sunshine to Hoth-level snowfall and back again. Much like Naked Prey or Conan The Barbarian. The Edge seems designed as the prototypical GUY movie. It’s a pre-Spike TV testament to the Hollywood belief that dudes just want to hang out and watch other dudes fight bears. And you know what, Hollywood is ABSOLUTELY right. I can’t remember the last time I enjoyed a movie so effortlessly. The Edge is like if Jeremiah Johnson were produced by Aaron Spelling. It’s a snort-inducing mixture of soap opera dialog and straight up man-on-beast fight scenes. Part of what makes The Edge supremely enjoyable is the unapologetic movie-ness of it. Like the fact that Alec Baldwin’s hair stays coiffed in the late 90s front flip regardless of how many nights he’s gone without eating or showering. Or how Hopkins beard length literally changes shot by shot. Not to mention lines, delivered with complete seriousness, like: “You can’t kill the bear Charles! He’s ahead of us all the time! It’s like he’s reading our minds! He’s stalking us for God’s sake!”. And you’d be correct if you thought maybe screenwriter David Mamet is pulling our leg. Everything is so perfectly set up for disaster it borders on parody. The Edge is not for the self-serious. It’s not for people who can’t take a joke. It’s a movie about a photographer and a billionaire who fight a BEAR. It’s a conceit right out of Boy’s Life. The Edge is old school adventure film-making at its finest. You get a bunch of attractive people into an exotic location, throw in a couple dangerous natural elements, and just have them roll with it. The great thing about The Edge is that it could’ve been made eighty year ago with the same exact script. Mamet’s sly sense of humor also begins to take hold mid-way through the film. First, there’s a scene where our heroes must cross a log to escape the pursuing bear. The log just so happens to be positioned over a raging waterfall. Instead of getting low and crawling across the log, like a sane person would, each man decides to tightrope-walk the log. When it’s finally Hopkins turn to cross, the bear, no joke, gets on one end of the log and starts bouncing it up down. You know, like a Jack London version of one of the those obstacle course TV shows, Wipeout or THE HOLE. (For the record, whenever I wonder why this country still doesn’t have a single-payer healthcare system…I think of that clip). Second, there’s a point when Stephen starts freakin’ because the group realizes they’re completely lost. In order to calm Stephen down, Charles asks Stephen to make him a spear. Charles asks the black guy to carve a spear! Two scenes later Stephen is eaten by the bear. Two rich white guys make the black guy build a spear and then he’s promptly eaten by a bear. I’d be offended if it weren’t so deliberately absurd. A brief word on the performances. I’ve always loved Alec Baldwin. He’s a lot like James Spader in the way that he relishes every single line of dialog. I love the unrepentant theatricality of his delivery. Baldwin is a movie STAR. To me that means he can never disappear into a role. Daniel Day-Lewis ACTS in a role. Alec Baldwin STARS in a role. One isn’t necessarily better than the other. They’re just different. Meanwhile, Anthony Hopkins is almost too good for this material. Baldwin chews the scenery and captures the nutso rage-filled tenor of their desperate scenario. Hopkins is too restrained. You’d think he were secretly shooting a Terrence Malick movie at the same time. I suppose it works. The Edge has fun playing the fevered up-tempo Baldwin stuff against the slow, focused intensity of Hopkins. And before we go, let’s not forget a singular performance from famed bear-actor, Bart the Bear. Bart is an Alaskan Grizzly and star of such films as The Bear (fittingly), Legends of the Fall (also with Hopkins), and White Fang (back when Disney was really doing it). If you’d like a more sentimental take on Bart’s legacy watch this video in which a grown man wearing a denim shirts weeps while discussing Bart’s life. ← Don’t Hate The Player. Hate The Game.